An experiential sneaker convention.....for fun! 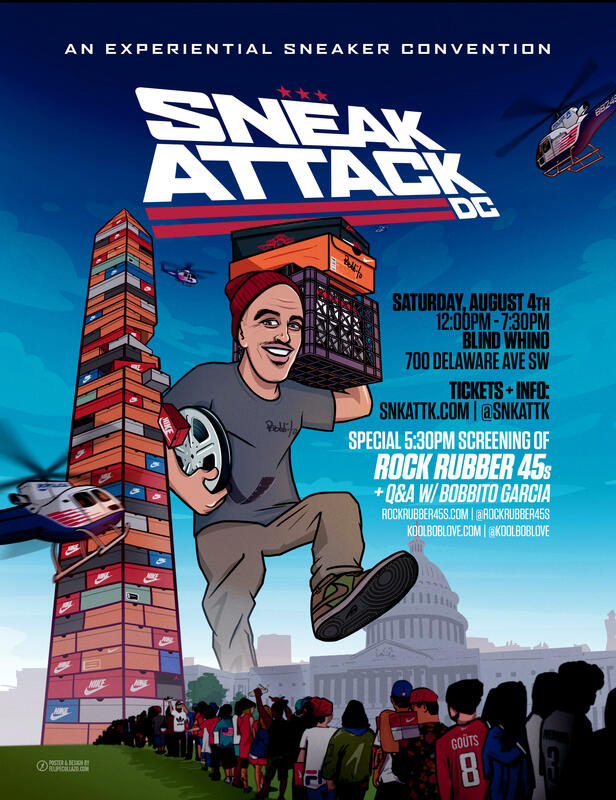 For the past five years, Sneak Attack DC has offered a platform for the area's like-minded sneaker enthusiasts to buy, sell, trade and connect. Through continued support over the years, we've been able to expand our reach, involve more vendors and partner with larger venues. We're happy to bring back another edition, but this time with many more cultural experiences! Beyond the traditional buy/sell/trade sneaker convention, we're aiming to build an innovative sensory experience of the lifestyle we admire through art activations, community involvement, interactive DJ performances, and a very special movie screening. All ages event. Tickets will be available at the door for $20. Sneak Attack is honored to have built relationships with some of the areas top vendors and brands that deliver diverse and exciting offerings. This year we will feature over 30 vendors, collectors, store owners, artists and brands - giving you something different at every corner! For those not grabbing a table, no sweat! We will have a designated trading zone where you can post up with your kicks and get to selling or trading. Looking to have a strategic location to sell your kicks? Vendor tables provide you with a competitive edge when selling your sneakers at Sneak Attack DC. Contact us with any questions or simply purchase a table above! Tables are limited like most good things in life, don't miss out. 1. As care packages with good-to-new condition sneakers along with other essentials to distribute to our homeless neighbors around the city. 2. To serve as the building blocks for an obelisk we are building for the event to commemorate our cities sneaker culture. Towering at over 20 feet tall, the obelisk will resemble the Washington Monument, but more importantly raise awareness around the amount of help we can provide as a community. We will be hosting a donation drive at the event for good-to-new condition athletic sneakers or any essential toiletries (socks, deodorant, tooth brush, etc.) to put into our boxes. The Sneak Attack team will then go around the city distributing the donated kicks to those in need. Every donation to the give-a-way initiative will also enter you for a raffle to win some hype prizes! Follow us on IG (@SNKATTK) to find out what you can win, but most importantly just keep in mind that the pair of kicks collecting dust in your closet could give someone a new way to walk this summer. We are excited to expand on our long-time partnership with Connecting Cool, thru presenting an immersive Diggin' Thru the Crates (DTTC) hip-hop exhibit at Sneak Attack DC. Prepare to experience a one-of-a-kind, uniquely curated installation highlighting the preservation of hip-hop, street art, and sneaker culture. Attendees will have a chance to view, listen, and genuinely experience the origins of hip-hop by "diggin thru" the Connecting Cool hip-hop collection: featuring vintage & current vinyl, cassettes, books, art and media installations. DJ Alizay will be holding down the 1s and 2s, taking strictly vinyl requests from the crates. Are you a vinyl head? Feel free to bring some of your own vinyl to share and play! Following the convention their will be a screening of Bobbito's new documentary Rock, Rubber, 45s, paired with a Q&A with Bob! Rock, Rubber, 45s is a cinematic odyssey exploring the connectivity of global basketball, sneaker and music lifestyle through the firsthand lens of authentic NYC culture orchestrator Bobbito Garcia. The film explores Garcia's youth dealing with mistreatment, educational quandaries, identity, and loss as well as his ascension to self-determination as an adult freelance creative. The ballplayer/author/DJ/filmmaker has carved an independent career that has inspired millions throughout the world, and has affected the growth and direction of the footwear, hip hop, and sports industries in the process. Screening will begin at approximately 5:30PM with the Q+A right after. Seats are limited and not guaranteed. We will do our best to accomodate everyone. Tickets to the convention are also good for the screening. If you can't make it to the convention, but still want to catch the screening and Q&A $5 movie tickets are available.